This year I've adapted the ELO-based MARS Rating system so that it now provides a margin of victory as well as a tip for each game. Based on the current ratings, these margins and tips can be generated for all the remaining home and away matches and these, in turn, can be combined with the existing table to arrive at a projected end of season table. Well, I've just done this and the results appear below. Our projections have Hawthorn and Adelaide slipping into the top 8 at the expense of the Lions and the Dons. Adelaide is a particularly interesting case to look at. It is projected to finish 7th despite currently being 12th on the ladder and ranked only 10th on current MARS Ratings. So, how can it be projected to climb 5 ladder positions? It's on the strength of its easier draw for the remainder of the season. Collingwood is another team that appears to benefit from its draw according to MARS Ratings, though less so than does Adelaide. The Pies are projected to finish 4th despite currently being 8th on the ladder and ranked only 5th by MARS. 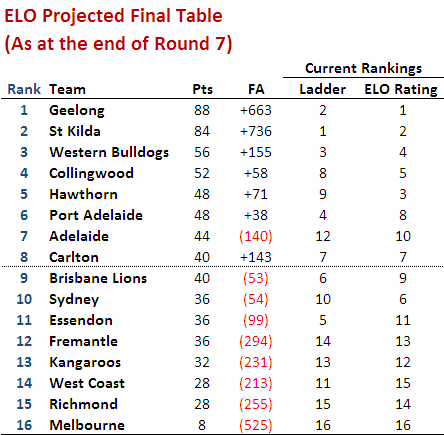 In contrast to Adelaide and Collingwood, Carlton suffers, to a small degree, from a difficult remaining draw, evidenced by the fact that its projected final ladder position is below both its current ladder position and its current MARS Ranking. All other teams are projected to finish in a position that is between (or equal to) their current ladder position and current MARS Ranking. One other notable feature of the projected ladder is that it takes only 10 wins to make the final 8 whereas, historically, it has usually taken 12 or 13 wins. This is due to the projected dominance of Geelong and St Kilda; their combined projected 43 wins doesn't leave many points to go around.